Don't worry! Everything in that picture is 100% vegan. I used Violife cheese slices, Hobelz vegan cold cuts and my delicious tofu cream cheese. The Wasa fiber crispbread (knäckebröd) is a bit of a carb splurge, but it only has about 4 grams of carbohydrate per slice. You could make this with the special Atkins brand crispbread (also vegan!) which only has 2 grams of carbs a piece. Or if you're the industrious type, you can use one of my bread recipes or make your own flax crackers. 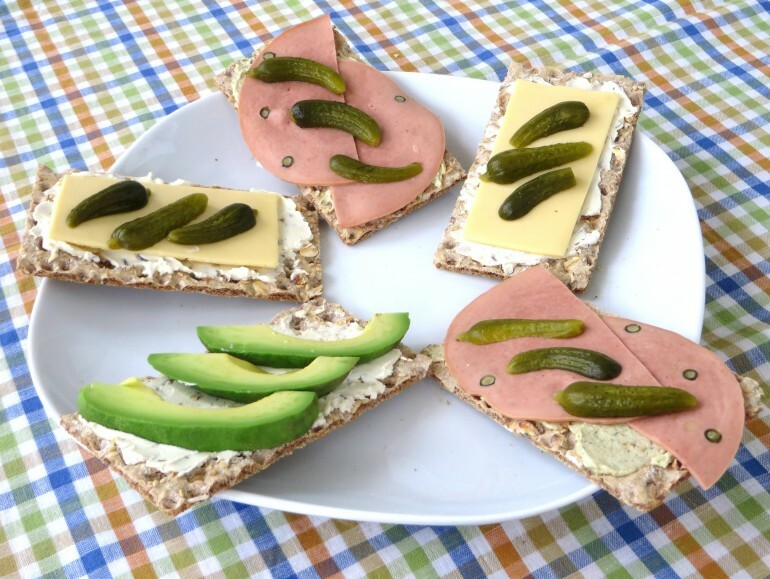 If you pile on the toppings, moderately low carb crispbread can make a really nice and quick lunch that doesn't have an astronomical carb count. For instance, the plate full of Wasa crispbread sandwiches in the picture has about 450 calories, 30 g net carbohydrate, 17 g fiber, 28 g fat and 15 g protein. Don't be skimpy with the toppings, because that's what makes this a filling lunch. If you want to lower the carb count, use fewer crackers and make more layers of toppings! You can put on mayonaise, nut butters, pesto, tapenade, avocado, seitan, marinaded tempeh or tofu, argula, sauerkraut, pickles, cucumber, whatever you fancy. If you're like me and love crackers, it's a real treat.